EasyInstallä EAF cable covers for EAF water cooled cables provide protection to AC and DC Electric Arc Furnace water cooled high-current cables, protecting them with the toughest sleeve available specifically designed to protect against heat, flame, molten splash and slag. Available in any size. 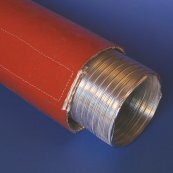 For sleeve up to approximately 2 inches in diameter, a 0.75" wide velcro closure is used. For sleeves between approximately 2 and 6 inches in diameter, a 1" wide velcro closure is used. For sleeve above 6 inches wide, a 2" wide velcro is used. Sewing of the sleeve is performed using a Nomex, Kevlar or Fiberglass thread. 2200°F / 1205°C for periods up to 15 minutes and short flash excursions to 3000°F / 1650°C.